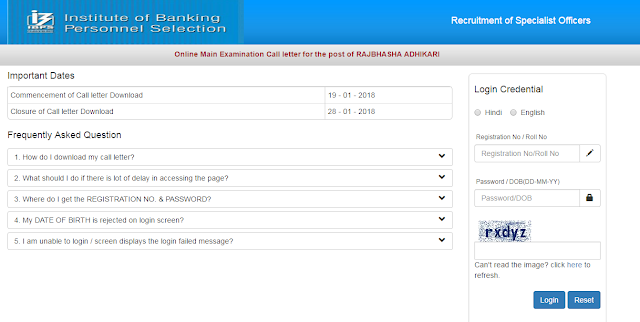 IBPS SO Mains Exam Admit Card-Institute of Banking and Personnel Selection(IBPS) has released call letter/Hall tickets for IBPS Specialist officers CWE-VII Mains Online examination. As per Notice IBPS SO Online Mains Examination 2017-18 is scheduled to be conducted on 28th January 2018. Click on below Given Link to Download your Call Letter for Rajbhasah Adhikari & other posts Mains Examination, also check IBPS SO Mains Examination Information Handout. All The best for IBPS SO Mains Examination.